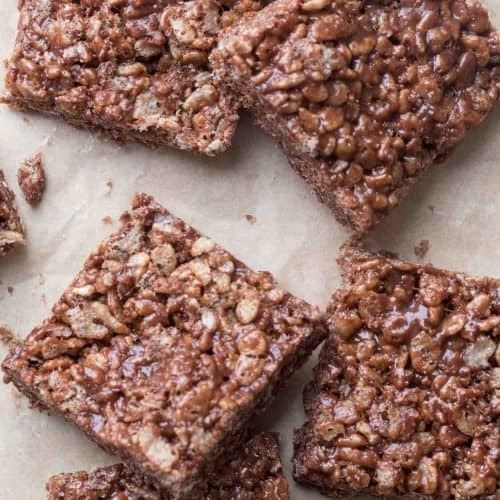 The most amazing Nutella Rice Krispie Treats Recipe. 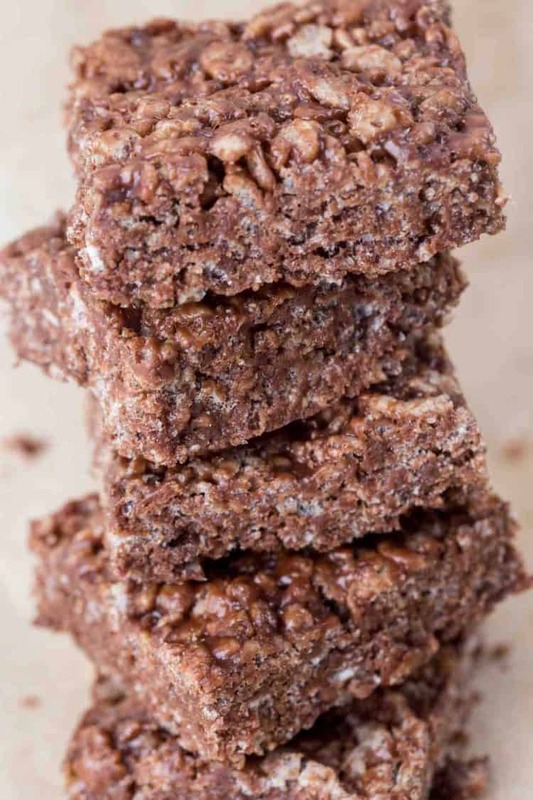 Though we enjoy making Classic Rice Krispies treats, these hazelnut Nutella krispies are a family favorite, especially with the kids. 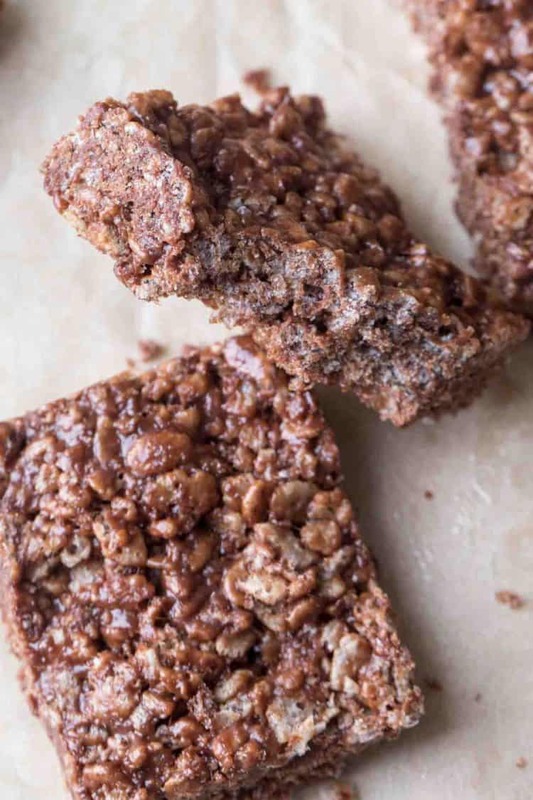 Soft and chewy krispie bars loaded with butter, marshmallows, cocoa and Nutella that are made in 10 minutes. Our popular Layered Nutella Cake is another recipe we love with hazelnut spread. There are so many different variations to rice krispie treats (rice crispy treat bars). This variation is so good and no baking required. Rice Krispie cereal mixed with marshmallows and butter with hazelnut spread (Nutella). These are perfect to make when kids either want to help in the kitchen or are asking for kid-friendly dessert. Buttery and gooey chocolate bars loaded with crispy cereals pieces. Not only is the recipes super easy and quick – it tastes amazing. So, these rice krispie treats come together really quickly. For everything to go smoothly, measure everything and prepare a baking dish before starting. In a bowl, combine the cereal with cocoa, mix. In a Dutch Oven (or any pot with a thick bottom), melt putter oven medium heat. Add marshmallows and keep stirring until the marshmallows completely melt. Remove from heat and quickly stir in hazelnut spread. Quickly stir in rice krispie cereal and mix vigorously until well combined. Transfer everything to a baking dish and gently pat down mixture. NOTE: DON’T melt butter and marshmallow at high heat. It will burn and result in hard bars. For chewy and soft treats, take your time (yes, it’s hard – be patient). do rice crispy treats have to be refrigerated? No, rice krispie treats may be stored in an airtight container at room temperature up to two days, best if used in one day. Yes, store rice krispie treats in a freezer bag up to one month. To enjoy, thaw and eat the same day. 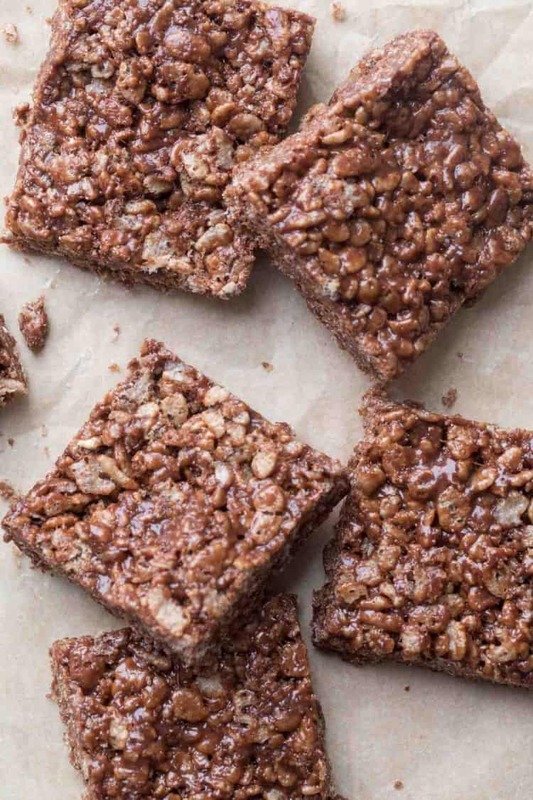 These no-bake chocolate hazelnut bars are so GOOD. Chewy, soft and full of buttery marshmallows with cocoa and hazelnut spread. Perfect treats to make for the kids to pack for lunch or an afternoon snack with cold milk! Chocolate Chip Cookies– so soft and chewy. Peanut Butter Chocolate Chip Cookies– perfect balance of flavors. Banana Bread Muffins– Banana bread but better. Rice Krispie Treats Recipe. 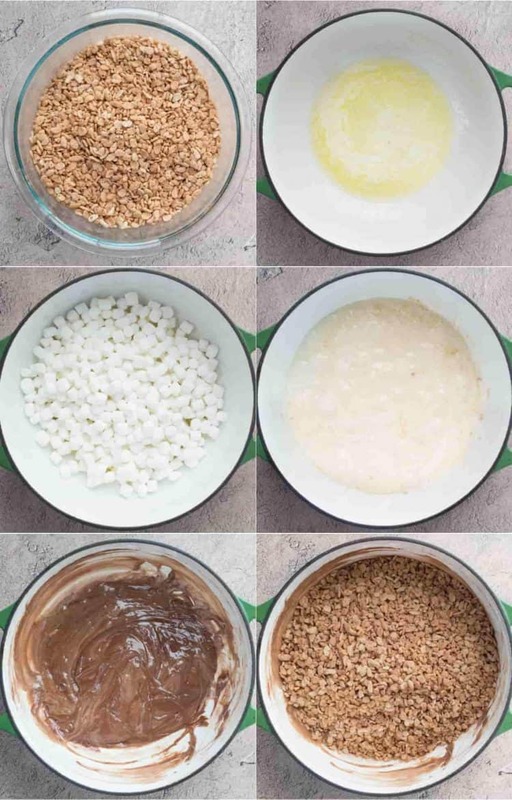 Rice Krispie cereal mixed with a buttery marshmallow mixture, cocoa and Nutella hazelnut spread for the ultimate kid-friendly dessert bars. No bake and ready in 10 minutes. Line a 9"x13" baking sheet with parchment paper and lightly spray with baking spray. Combine cereal and cocoa in a bowl, set aside. Measure out the Nutella, set aside. In a large pot, over medium heat, melt the butter. Add the marshmallows, keep stirring until the marshmallows melt completely. Remove from heat. Quickly stir in Nutella. Add the cereal and mix vigorously. Transfer to the prepared glass dish and press down. You can use a smaller dish if you want the krispies thicker. Original recipe was posted April, 2014. Post is updated March, 2019. So delicious and easy – we loved them! Courtney, thank you! I am glad you enjoyed our Nutella Rice Krispie treats! What a fun recipe! My kids love Nutella; they will enjoy making these! You had me at Nutella! OMG . SO GOOD! do you have to refrigerate before eating? if so, for how long? Thank you, dear! Great!!! Where is your pin button, not to loose this recipe somewhere;)??? ?